U.S. life expectancy dropped for the second year in a row in 2016, a shocking trend reversal driven by the increase in drug overdose deaths, according to a report released Thursday by the Centers for Disease Control and Prevention. The last time the United States saw a two-year life expectancy decline was in 1962 and 1963, thanks to influenza, according to the CDC. There was another one year drop in 1993, at the peak of the AIDS epidemic, the Washington Post noted. In 2016, total life expectancy fell by one tenth, from 78.7 years to 78.6. Among men, it fell two tenths, from 76.3 to 76.1; among women, it remained steady at 81.1 years. 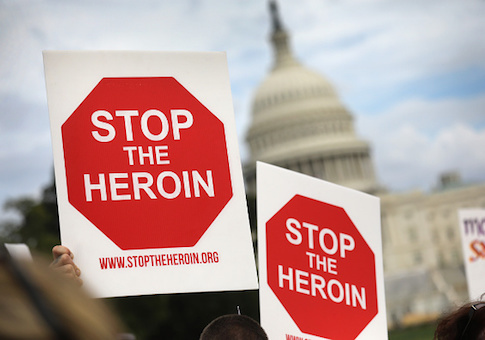 The overwhelming bulk of the decline is attributable to the rise in drug overdose deaths among Americans in 2016, data about which the CDC also released. New official numbers found some 63,600 drug overdose deaths in 2016, an increase of more than 11,000 against the 52,404 drug overdose deaths in 2015. The rate of drug overdose death has tripled since 1999, the CDC noted, increasing from 6.1 per 100,000 people to 19.8. That includes an average 18 percent increase between 2014 and 2016. Men die from drug overdose at about twice the rate of women, helping to explain the disparity in change in life expectancy. Drug overdose deaths rose across all age groups. West Virginia led the pack among states with the highest overdose death rate, 52 per 100,000 population. Behind it were Ohio (39.1), New Hampshire (39.0), the District of Columbia (38.8), and Pennsylvania (37.9). Among such deaths, opioid abuse predominates as the cause. Of the overdose deaths, 42,249—or 66 percent—were attributable to opioids, a number which makes the narcotic drugs more deadly than breast cancer, CNN reports. The rate at which Americans died from overdoses attributable to synthetic opioids, like fentanyl and its analogs, doubled between 2015 and 2016, from 3.1 to 6.2 deaths per 100,000. That rate increased by 88 percent per year between 2013 and 2016. U.S. Customs and Border Protection reported seizing 1,485 pounds of fentanyl in 2017, up from two pounds seized in 2014. Dr. Robert Mitchell, the D.C. chief medical examiner, told a recent meeting of the United States Sentencing Commission that fentanyl was responsible for the deaths of many long-term heroin users in his jurisdiction, who died after taking the super-powerful opioid after years of stable heroin use. Deaths from heroin and other natural/semisynthetic opioids also increased, although less pronouncedly. The underlying causes of the reversal in life expectancy trend may be more complicated than simple drug addiction. Much of the recent decline is driven what Princeton economists Anne Case and Angus Deaton call "deaths of despair"—deaths from suicide, alcohol abuse, and drug overdose. Such deaths—especially opioid deaths—are more likely to strike the socially disconnected, according to a recent report from Sen. Mike Lee's (R., Utah) Social Capital Project, which argued that the unmarried and uneducated are more at risk of opioid addiction and eventual drug overdose death. In other words: the opioid crisis, and its concurrent effects on U.S. life expectancy, is indissociable from the crisis of social connectedness, especially among America's ostensibly comfortable white plurality. Also on Thursday, Attorney General Jeff Sessions announced a new senior level position within the Department of Justice to address the opioid crisis. The Director of Opioid Enforcement and Prevention Efforts will be responsible for formulating, implementing, and coordinating DOJ policy on opioids. "With one American dying of a drug overdose every nine minutes, we need all hands on deck," Sessions said. "Today we take the next step: creating a senior level official position at the department to focus entirely on this issue. This department will continue to follow the president's lead, and I am confident that we can and will turn the tide of the drug crisis." This entry was posted in Uncategorized and tagged Drugs, Opioids. Bookmark the permalink.